Clara May Miller, age 103, of Black Lake, died at The Brook of Cheboygan on Friday, November 16, 2018. Born in Clark Lake, Michigan on May 2, 1915, Clara was the daughter of Perry and Lula (Sutfin) Wetherby. After graduating from high school, Clara attended Michigan State College and earned her bachelor’s degree in home economics and domestic studies. At a time when very few women attended college, Clara was indeed a woman before her time. She went on to work managing a restaurant before she married Edward Miller in East Lansing on July 8, 1939. They made their home in Detroit where they lived for many years and spent 61 summers at Black Lake before making it their permanent home in 2000. A skilled homemaker with a good eye for decorating, Clara made a warm and loving home for her family and made everyone feel like they had a special connection with her. She had an appreciation for fine table linens, an elegantly set table, and wonderfully delicious cuisine. She was an excellent cook and baker. Oatmeal chocolate chip cookies and homemade pies were a couple of her specialties, although she was forever trying new recipes. Clara May also had an appreciation for a good cup of coffee; she always enjoyed a hot cup of fresh brew. Strong in her Christian faith, Clara read the Bible in its entirety and attended Bible study groups. 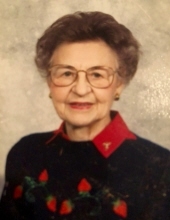 She was a long time member of Bushnell Congregational Church, attended the Congregational Church of Novi for many years, and then in later years St. Paul’s United Methodist Church in Cheboygan. She enjoyed doing cross stitch, macramé, and puzzles. She lived to be 103 years old, but Clara was young at heart in her outlook on life and in her fashion sense right down to her Sketchers shoes. A gentle, caring lady who was friendly and congenial, Clara never had a bad word to say about anyone. This remarkable lady who was blessed with a long, healthy life will be sadly missed but the memories and stories of her years will live on in the hearts of those who knew and loved her. Clara leaves her daughter, Barbara (Joe) Gotz of Onaway; son, James (Beverly) Miller of Black Lake/Ann Arbor; grandchildren, Fred (Jennifer) Miller of Mt. Clemens, Alice (Chris) Bailey of Ann Arbor, and Jennifer (Dennis) Renton of Leesburg, Virginia; as well as six great grandchildren, Clara, Nate, Olivia, Audrie, Emily, and Rebecca. Clara is also survived by her brother, Perry (Jeanne) Wetherby of Grass Lake; sisters, Grace Mulnix and Mary (Donald) McUmber, both of Clark Lake, and Nancy Harris of Forest Park, Illinois. Clara was preceded in death by her husband, Edward A. Miller; granddaughter, Janet Gotz; brother, Lee Wetherby; and sister, Jean Verspoor. A service of celebration will be held in the spring at Waverly Township Cemetery in Onaway. Those planning an expression of sympathy please consider a donation in memory of Clara May to The Brook of Cheboygan, 11965 Townline Road, Cheboygan, MI 49721. To plant a tree in memory of Clara May Miller, please visit our Tribute Store. "Email Address" would like to share the life celebration of Clara May Miller. Click on the "link" to go to share a favorite memory or leave a condolence message for the family.